This professional model features a silver plated or gold epoxy lacquer finish on body and keys, an engraved bell, and mother of pearl key buttons. The bell, bow and body provide better response and tone color through the annealing process. A front F key, high F# key, and custom style Bb spatula facilitate technique and alternate fingerings. Superior intonation is provided by refined tone hole dimensions and placement. The ribbed and flanged post mounting improves response while providing a more resonant sound and better post stability. An adjustable thumb rest also increases the player's comfort. 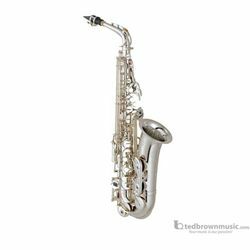 Yamaha's newest addition to the pro saxophone lineup is the updated version of the popular 62 series.